From UHP and research-grade pure gases to medical-grade gases and EPA protocol mixtures, we provide a multitude of specialty gases. Mixed gases are blended according to their specialized use, such as calibration of analyzers, medical technology, pulmonary function studies, and microbiology incubations. 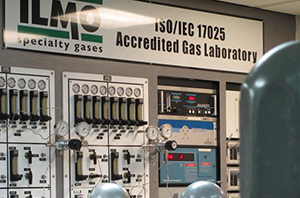 From gas for device calibration, to laser gases, ILMO is your single source for your specialty gas needs. A multitude of specialized gases are provided by ILMO. Our technicians are trained in the latest quality methodology and provided with state-of-the-art technology to detect, identify, and quantitate contaminants. For you, these exacting standards mean dependable, high-purity products with every delivery. If you can’t trust your EPA protocol gas mixtures, the integrity of your instruments could be compromised. And in an industry like yours, an inaccurate reading could lead to serious – and expensive – consequences.